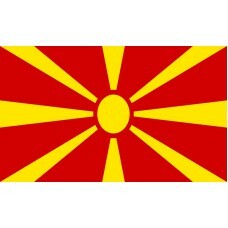 The Macedonian flag is red with a big yellow 8-ray sun with all the rays meeting the edges of the flags. 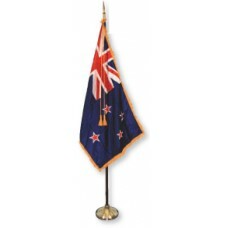 The flag was adopted on October 5th, 1995. 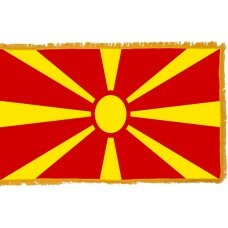 The red and yellow colors are the national colors of Macedonia and the sun on it is referred to as "The New Sun of Liberty" and represents a new beginning for Macedonia. The first Macedonia flag after their independence from Yugoslavia was adopted on August 11th, 1992 and that flag was red with a small yellow "Star of Vergina." Greece objected to their new flag as they believed the Vergina star was a Greek symbol that belonged to Greece only. 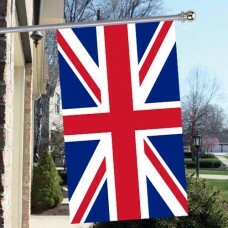 Greece imposed a one-year economic blockade on Macedonia, in order to force them to change the flag. The new Macedonia flag was designed by Professor Miroslav Grcev, and it is one of the newest flags. Macedonia is a country that has endured many revolutions and struggles to seek independence. In 1389AD, Macedonia was taken over by Turks until 1912. Between 1767-1891 they were many attempts to overthrow the Turks, to no avail. From 1912-1913, Macedonia gained victory against the Turks after being joined by Serbia, Bulgaria, and Greece. Following this, Macedonia still did not have independence and were refused it, and instead Greece took a portion of Macedonia, naming it "Northern Greece" and Serbia took another portion, naming it "Southern Serbia." In 1918, as Serbia had already claimed a large portion of Macedonia, it then joined with Croatia, Slovenia, and Montenegro and named it Yugoslavia in 1929. During WWII, the German Nazis invaded Yugoslavia, who actually collaborated with them to exterminate the Jews. As a result of this, in 1944, Macedonia gained independence but soon lost it again after the Greek Civil War (1946-1949) and once again, became a part of Yugoslavia. In 1991, Yugoslavia crumbled, and Macedonia regained their independence. Macedonia is a landlocked country in Europe that shares borders with Kosovo, Serbia, Bulgaria, Greece, and Albania. The capital of Macedonia is Skopje. Macdonia is mainly a mountainous country with the highest mountain being, Mount Korab. The oldest town in Macedonia is called "Ohrid" (oldest human settlement in Europe) and it is home to Lake Ohrid, which is the deepest and oldest lake in Europe and it is also home to the Church of St. Sophia which is seen as the most important monument that Macedonia has as well as the oldest Slav monastery. A major tourist attraction that Macedonia has is the "Lake Marrovo" which has a half-submerged church in it and the cross at the top of Vodno mountain which is the 4th largest cross in the world. It was built to serve as a memorial for 2,000 years of Christianity and is referred to as the "Millenium Cross." Another major attraction is "Cave Vrelo" which is the deepest underwater cave in the world.